Mitsumine Shrine (三峯神社) is one of 3 major shrines in Chichibu, Saitama. It is one of the oldest shrine in Saitama. It was established in the time of 12th emperor, Keiko. The shrine is located in the beautiful forest of the mountain which has great power of nature. The main shrine was constructed in 1661. It has a beautiful carving arts and takes the excellent style of old architecture. 1. use Chichbu Line to Mitsumineguchi. 2. use local bus to Mitsumine Shrine. In Japanese Myth, the Royal Prince Yamato Takeru no Mikoto built the shrine here when he climbed up this mountain during the expedition of war to the eastern Japan. The view of this mountain was just like the birth legend of Izanagi and Izanagi. He enshrines them at this mountain. He named this shrine Mitsumine, literary means three mountains, because this shrine could be seen as beautiful 3 mountains from Chiba. In the time of Emperor Shomu, this shrine was entitled as Daimyojin to save the people from the sickness. In 745, the famous Buddhist priest Kekkei became the priest of this shrine. Since then it was highly respected by the people especially Samurai. Many feudal loads prayed for their victory at this shrine. 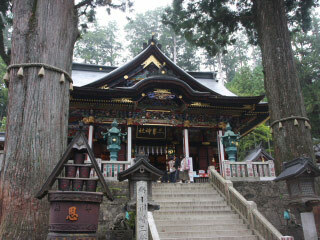 In 1533, it became the main Shugendo place for Tendai Buddhism. Today, many people still worship this shrine to receive the power of nature. The main shrine: constructed in 1661. The worshipping shrine: constructed in 1800. It has beautiful painted carving arts. Zuishin Mon gate: constructed in 1691. Toro Tower: constructed in 1857.